I want to explian how to create exception codes. An exception code can be used in case where the product will be change recommended bins or locations in the warehouse at putaway process. Aslo it used for your need. Describes the customizing steps necessary to set up an exception code for excluding products from packing, and a work center layout to use it in desktop environment. 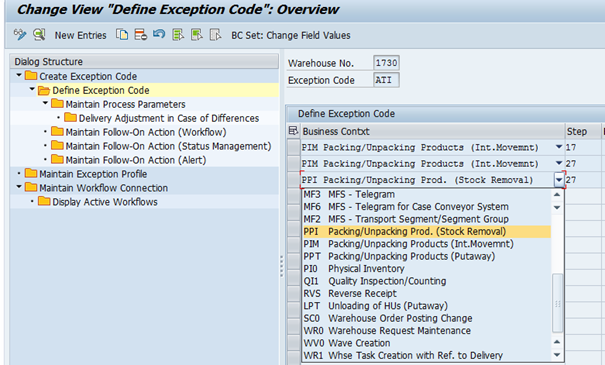 Customizing for Extended Warehouse Management->Cross-Process Settings -> Exception Handling -> Define Exception Codes. When you create the first exception code in a system that uses a workflow follow-up action to exclude products from packing that is based on workflow type 5, you first need to define a workflow connection. You do this in the corresponding tree node Maintain Workflow Connection. To control the task, enter the transaction PFTC_DIS from the SAP menu. Workflow template open the workflow that has 78500003 of damaged goods. It is important that this workflow is released because it will be used in connection to the Exception code. The data flow in the triggering events tab must be active because the exception code depends on the process workflow to be performed after the execution of the code. If it is not active, enter the transaction PFTC_CHG and select workflow to make sure the status is green. After the exception code has been created, it is necessary to define the Business Context of this exception code. In mantain process parametres, the type of storage process of the business context must be defined. We also define in this field which stock status of the exception code will work in this field. Maintain Follow-On Action, with the exception of the running of the exception code, we select the task control, confirm wave or create warehouse task after the running process. 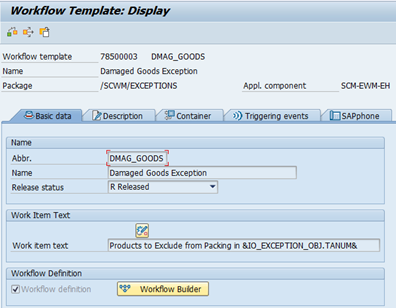 In the case of the workflow connection, we select the object category ABAP Class, type / SCWM / CL_EXCEPTION_OBJ_TOV1, event DMAG_GOODS. If you cannot find DMAG_GOODS in / SCWM / CL_EXCEPTION_OBJ_TOV1, the event that triggered the transaction code PFTC_CHG was not active. It may need to be checked again. When we display active workflow, we see that the recipient type has the Damaged Goods code that we display in the workflow instance. It is the simple way to understand how to create exception code and how to work. I wish this blog helps understanding exception codes.